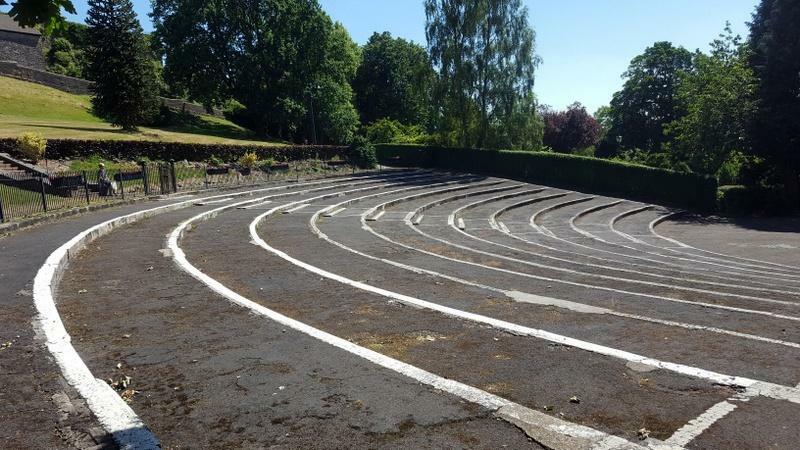 Photo Galleries Castle Bandstand get a Rotary makeover Around the Schools with the Purple4Polio exhibit. 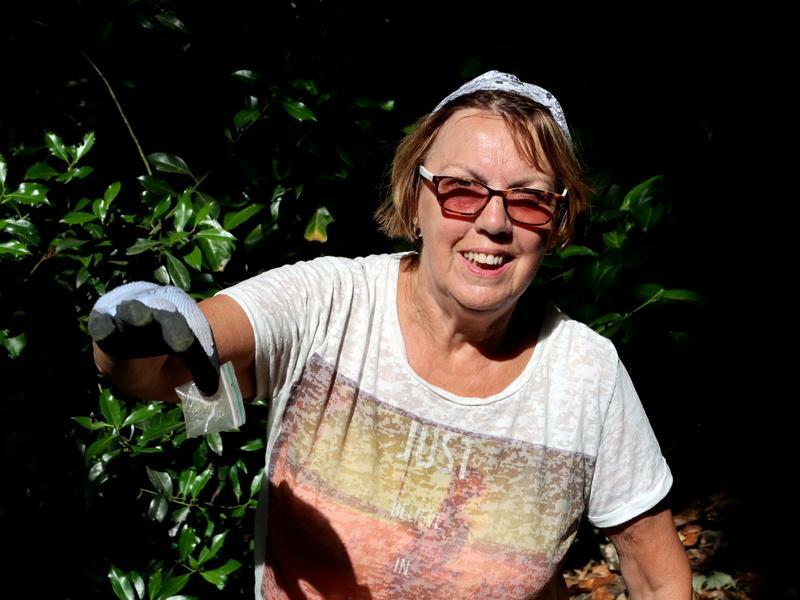 Purple4Polio comes to Brungerley Park! Fund Raising Blood Pressure Awareness Day 2018 85th. Clitheroe Rotary Birthday Party! Club Service Two New PHF's Smalls for All - Pants to Poverty! Training Page Purple4Polio at Clitheroe Market! Bonfire cash distributed. Club Council Update from Flexible Rotary Fifty Years a Rotarian! Membership & Membership Development Young Musician 2017 Technology Tournament 2019 Last Night of the Proms Purple4Polio the results! IT Schools Africa Update...... Cliderhow - The Club's Weekly Bulletin Flexible Rotary - report of meeting on 29 May Presidential Handover 2016 - 17 Rotary 2 - "Flexible Rotary" Youth Service New Year PHF's Thank you Julie! District Council Meeting Clitheroe Food Festival 2018 Skydiving challenge.... Bonfire Committee President Frank's Valedictory Meeting Bill’s Big 542 in 2016 Challenge for Cancer Research UK Clitheroe Community Bonfire 2018 Community Service Rotary 2 Video links Rotary at Work in the Ribble Valley District Council Meeting Rotary Bowling at Waddington Club. Mary has a ball! Youth Speaks update Sports Rotary Golf Day 2018 Purple4Polio IT4Africa International Purple4Polio Rotary Grand Tour Life Education Spring Clean.... District Council Meeting Rotary Golf Cheque Presentation 2018 President Mary hand over the cash and her chain! Young Chef 2019 National Rotary Day/Thanks for Life New Year's day @ Clitheroe Rotary Club Newsletter Booths Supermarket Collection 2018 Foundation The Beetle takes shape Pounds for Polio More Community Service in Clitheroe World Polio Day 2017 Three new Paul Harris Fellows Rotary Fellowship Exchange 2016 Litter pick Life Education at Christmas! 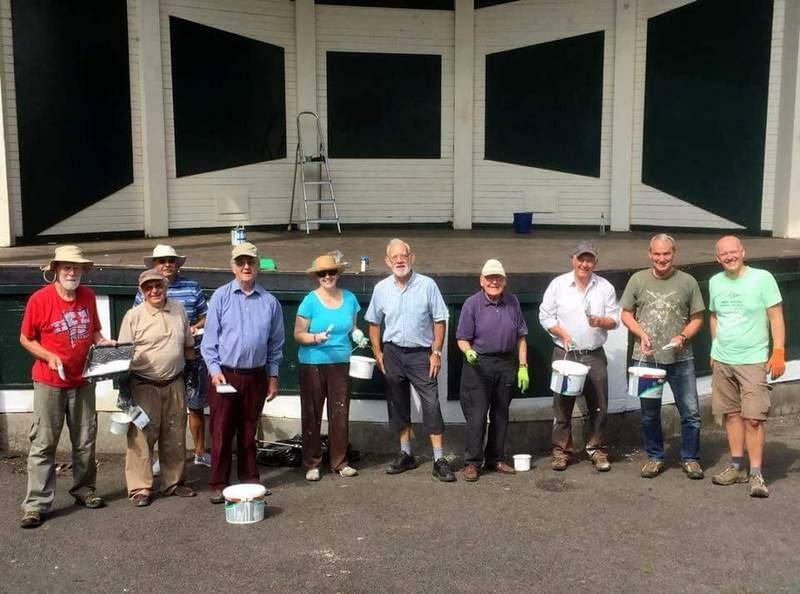 The Big paint and makeover of the Castle Bandstand..
Friday 6th July saw a team of Rotarians sweeping up and making ready the steps to be repainted in preparation for future events. 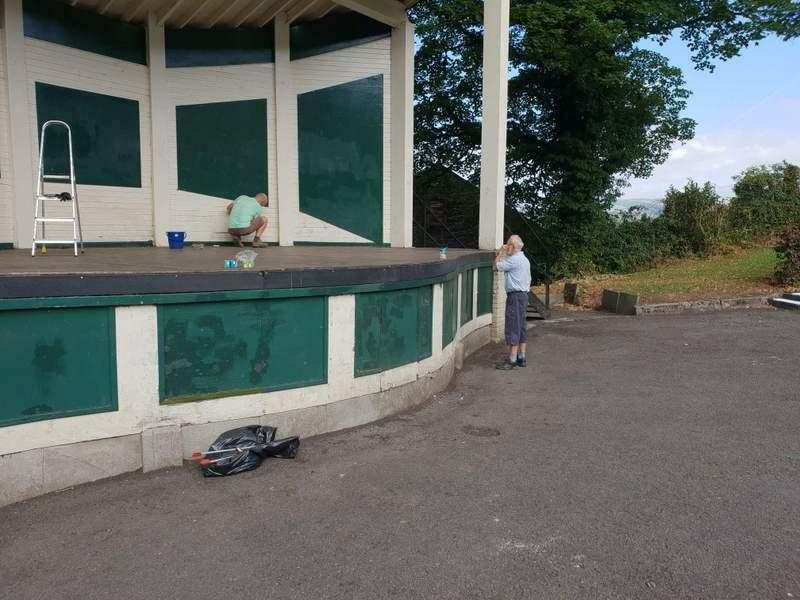 Friday 13th July and Saturday 14th July saw our team of volunteers repainting the white lines and also cleaning the interior of the bandstand. 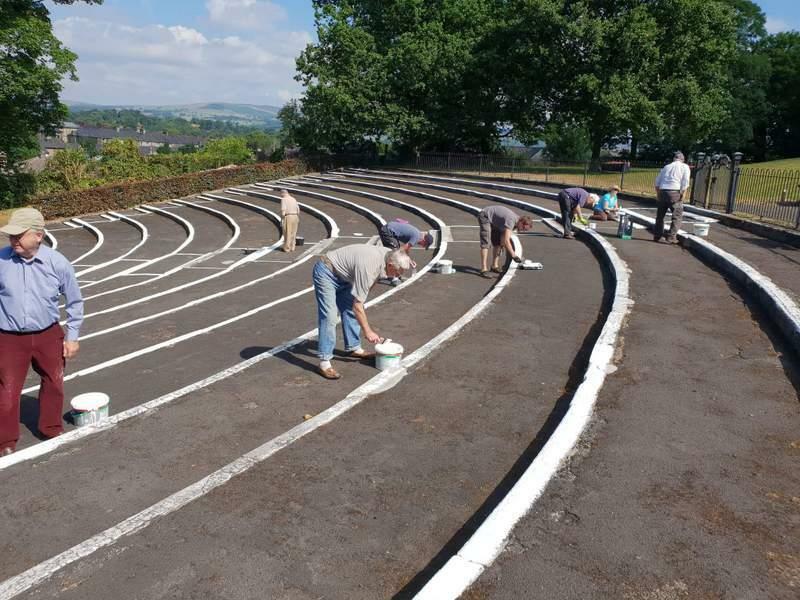 Our thanks go to all who helped to complete the work. 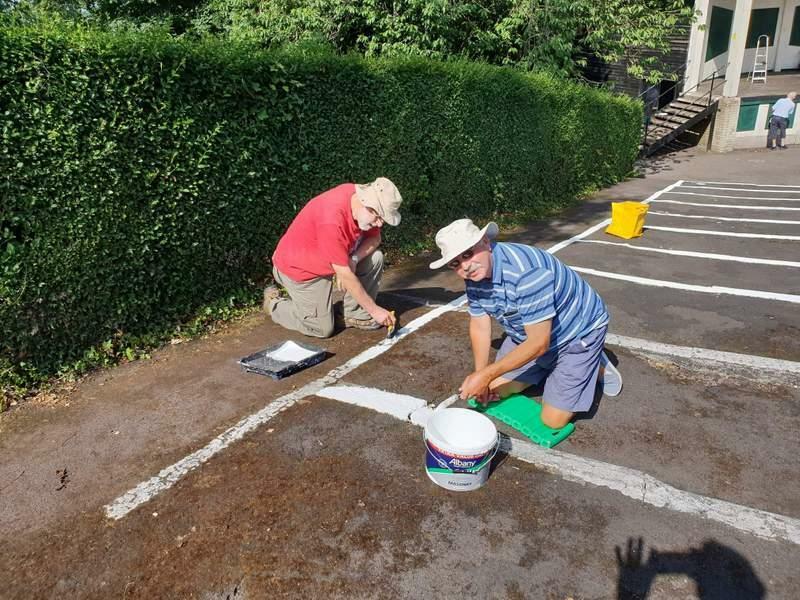 A special thanks to Crown Paints Recyling Unit and Nimtec jv who donated the paint and to local companies, Dawsons, Homebase and Clitheroe Decorating Centre, for providing additional paint brushes. 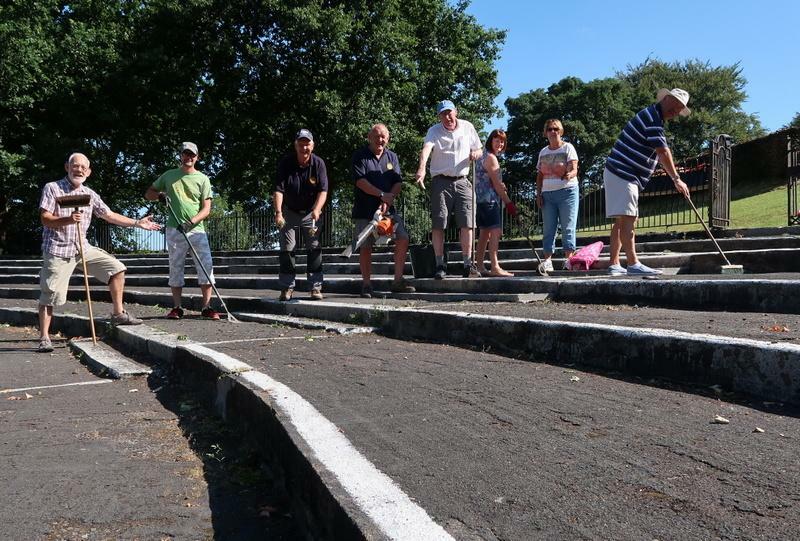 Rotarians also donated 53 hours of their time. 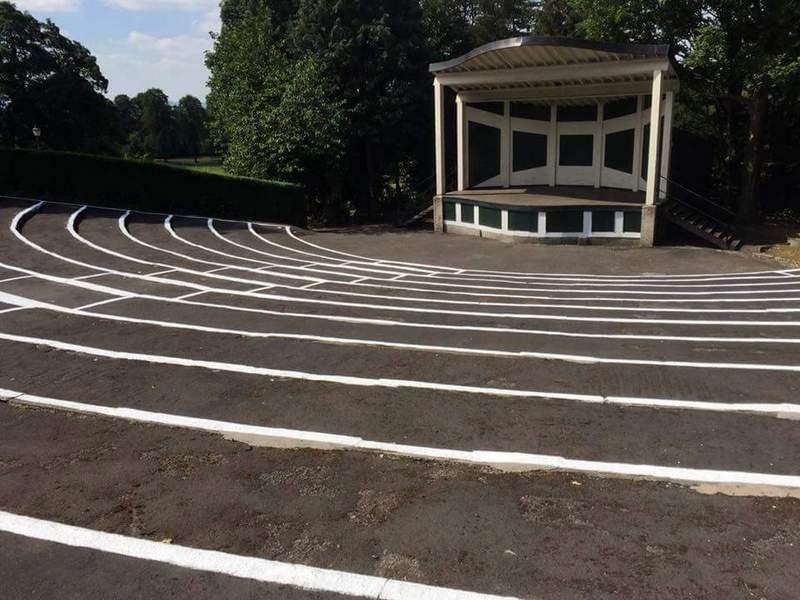 The bandstand area is now ready for the 'Last Night of the Proms' which is operated in conjunction with Clitheroe Town Council. the event takes place on Saturday 4th August. Do go along and give generously to this annual event which supports local charities.